- Computers, they’re everywhere and they aren’t going away anytime soon. - Many of the tasks that we used to perform with a pen and a pad of paper are now being done on our computers, laptops and PDA’s. - Everything from sending emails, writing reports, even scheduling our workdays is going digital. 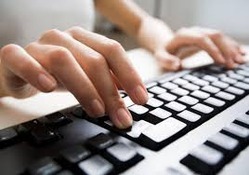 we provide english / hindi computer typing for Govt/Pvt jobs in 2003 and many students are settled in Govt/Pvt. jobs. Typing Practice By Typing Software.